Often overlooked, the hall gives the first impression of the rest of the home. It should be a place where guests feel instantly welcomed and at home and should be a place where people linger before leaving. I often find that some of the most profound conversations occur in the hall: perhaps it is the imminent sense of departure, which creates a certain sense of reckless abandonment in sharing things which might be uncomfortable, had you then to sit in a room with them. Or maybe there is a sense of urgency as the visit comes to a close – there is a desire to get to the heart of things before it is too late. Whatever the cause, hall talk is a category of conversation unto its own. Living in a flat, my hall is relatively tiny. However, I have still managed to make it a welcoming place which ushers people into the rest of the flat and which makes them feel comfortable to linger and chat at the end of a visit if they want to. There is a small IKEA bookcase in the hall, which stores a few essential bits of paperwork in pretty box files and a small set of wooden drawers. The set of drawers was also from IKEA, but I have painted it white and stuck Cath Kidston paper on the front of each of the drawers. 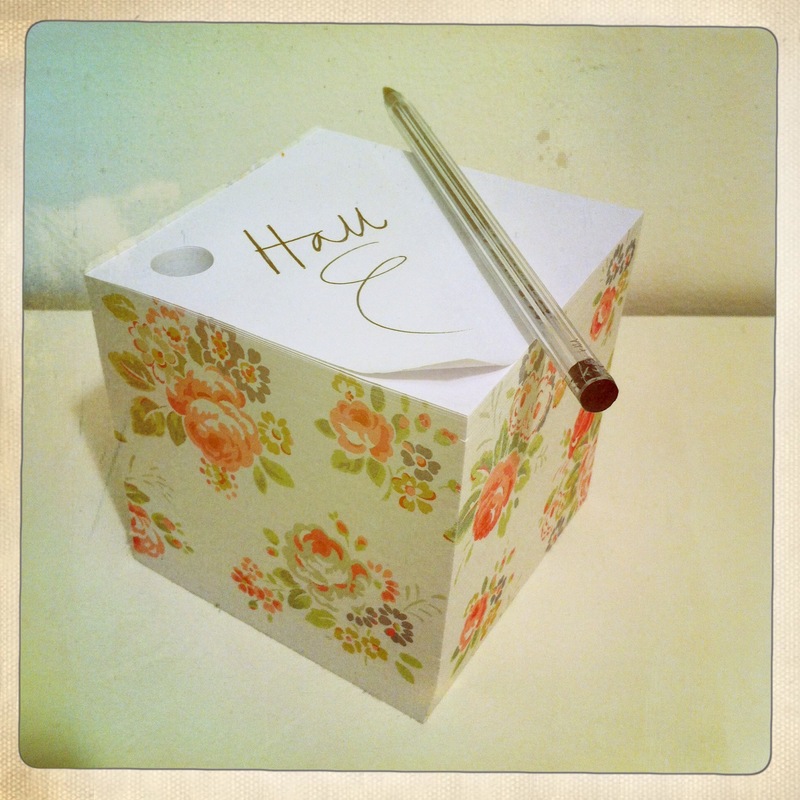 I’ve also covered plain box files in a variety of pretty wrapping papers to brighten up the small space a little bit. Complementary floral paper pretties up these wooden drawers. Pretty paper gives these box files a colourful and quirky appearance. The top of the bookcase is a useful spot to keep keys, so that they don’t get lost, and to keep a pretty note block for leaving last minute messages. My keys are always in the same place so I can’t lose them and this handy paper block is great for notes. I found this pretty little sugar dish in a Charity shop and it makes a brilliant bowl for keys. This picture hangs above the bookcase. I found these stunning black and white photos in an old issue of ELLE magazine and have framed them in a chunky black frame. I liked them so much that my friend and local photographer James Green did a photo shoot with me in the same style, which was brilliant fun and resulted in some gorgeous photos. Check out his other beautiful work here. I bought the metal ‘Welcome’ sign years ago from an ironmonger whilst on holiday in Devon. Two pretty little wooden signs hang from it, both of which were given to me as gifts. Artistic photographs don’t have to be expensive: look out for stylish images in magazines and use a frame which complements the colours. Long before the ‘Keep Calm and Carry On’ craze, I bought this postcard from the Imperial War Museum in London and framed it in a simple wooden frame from a local craft shop. Compared to the increasing price of these now-popular items, I think my version cost about £1.50. I love it as a reminder before I step out into the day. This postcard provides a useful reminder before leaving the home.